Hey all! First off, I wanted to thank you all for taking the time to stop off at my Patreon page! In case you aren't already familiar with me, I'm a YouTuber: cover artist, vlogger, and voice actress. Good question! Patreon is a sort of tip jar. Basically, it gives you the ability to give money to your favorite gamers, artists, YouTubers, vloggers, singers, etcetcetc. Patreon, unlike Kickstarter and other websites, funds my projects as long as you guys are willing to donate! So instead of ending after a certain amount of time, it's always up and running! 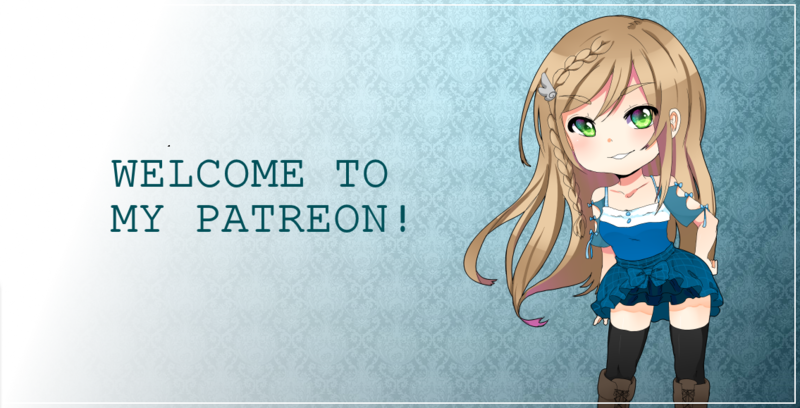 I encourage you to use it, as there's a lot of cool prizes you can get from becoming a Patreon to someone, such as myself! Aside from that, it also lets your favorite content creators create higher quality content. I'd have mine set up per month, so the amount you'd pledge would only be charged once a month. If this were to change in the future, fear not! Patreon has a "cap" limit, where you can limit the amount you want to donate. So say I switched it to per upload instead of per month, you'd only have to give the amount you're able to give. Any donation is welcome and very much appreciated, so don't feel pressured to give more then you can afford! Good question! Basically, I'm highly considering taking on a full career as a singer/voice actress. I've received so much support and love that I'd never even fathomed, so naturally, I want to be able to make higher quality content for you, my fans! As my fans, or even if you're just a kind passerby, I feel like you deserve the highest quality content. Right now, I currently do my best to upload at least one video a week; whether it be a song cover, comic dub, or vlog. Despite my setup, it can be really hard to get high quality recordings due to lack of sound proofing. If I'm able to make enough money, basically, I'd be able to fix my recording space, start hiring professional mixers, animators, and more to make the best quality contact for you, the viewer! Right now, it's my top priority to raise enough money to start getting my room sound proofed and basically transformed into a high quality recording studio. Get access to my patron-only feed, where I'll post updates, audio/lyrics previews, bloopers, and behind-the-scenes! You'll get MP3 download for every song I upload! You'll get an MP3 download to my acapellas! Your name will be put in the descriptions of all my videos (for each month you are pledged) with a thank you! You'll be able to make song suggestions that I'll be sure to look into! Since song requests can be quite difficult, they won't be high on the list but I'll do my best to do one every few months! This tier is solely donation based, so sadly it doesn't have any extra perks, and it just meant for those who really wanna help support me! Let's up the content! Instead of one song cover a month, we'll up it to two! We'll also up comic dub releases to two a week!